Alex Jasin is the CEO of Metapress, a fast-growing publication where visitors can learn new skills, gain inspiration and discover more about what interests them. Alex is also the founder and CEO of X3 Digital, a Google Certified digital marketing and design agency, where he helps businesses grow through paid search, search engine optimization, web development, mobile apps, content marketing, and branding. 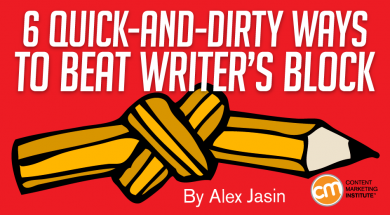 Alex's writing can be found on Entrepreneur, The Huffington Post, The Next Web, SUCCESS, Business.com, and other leading publications. Connect with Alex on Twitter, Facebook and LinkedIn. A severe case of writer’s block could lead you to rethink how often you publish.